There’s no question about it, when it comes to big cities, one of the most daunting to-dos is always finding a good place to stay. Attempting to balance factors like location, comfort and price can be mind-numbing, especially so when you’re in a big city spoiled for choice. And welllll, it doesn’t get much more ‘big city’ than London. With over 1000 hotels in this sprawling metropolis, it’s easy to get overwhelmed by the different options. Given the sheer size of the city, the different attractions to consider, and infinite factors like cleanliness and amenities, the choice is absolutely dizzying. But, I am happy to report that on my recent England trip, I found a real gem of a place that I’d highly recommend: the Amba Hotel Marble Arch. If you’re still scouring the net for options on where to stay in the ol’ English capital, here’s a little peek at what this great hotel has to offer. We’ll start with the basics first: the rooms at the Amba Marble Arch really do take comfort to the next level. We stayed in one of the hotel’s studio apartments, which was luxuriously spacious, with not only a big fluffy bed and desk, but a separate lounge and seating area to boot. Now, because of our short stay, we were hardly able to take advantage of everything the room had to offer, but it seems clear that the folks at Amba have guest needs down pat. I mean, we even had an in-room iPad for room service and browsing! Our mini apartment had all the perks of a hotel, alongside helpful extras for added comfort, including a small kitchenette, espresso machine and even two crystal clear TVs. Granted, two TVs seemed a bit excessive for just us two, but for families or bigger groups, I can imagine how this would be a lifesaver. Speaking of lifesavers, the room also came with a complimentary minibar, loaded with prosecco, beers, soft drinks, water and a few snacks. Overall then, a preeetty decent space to come home to. 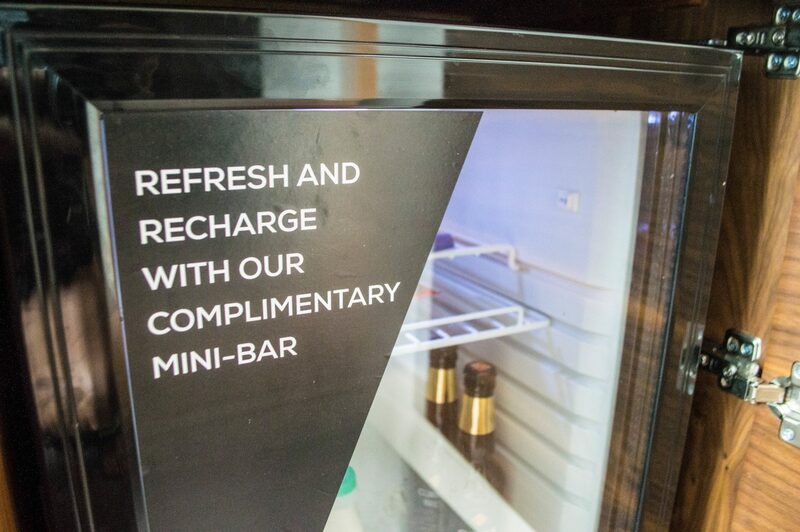 Complimentary mini bar at the Amba Marble Arch! When sightseeing is your goal, location is everything. 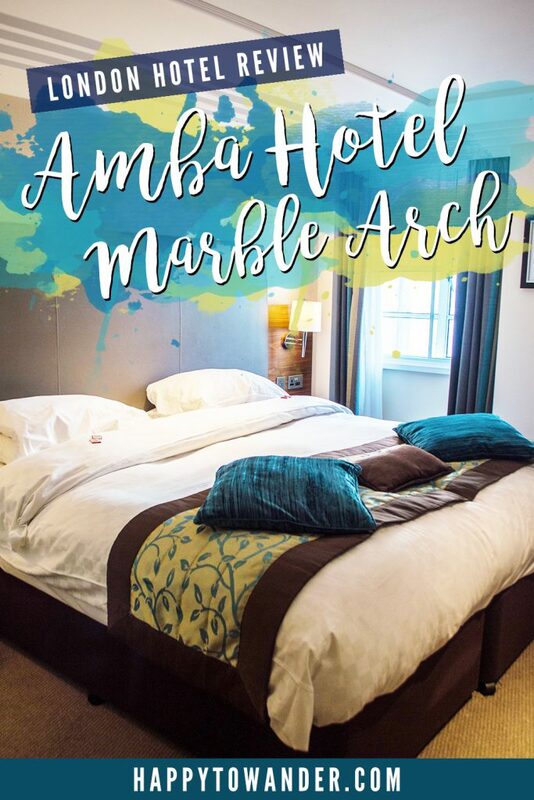 Conveniently, the Amba Hotel Marble Arch is just a few steps away from the Tube Station, a short walk from Hyde Park, and smack on the shopping mecca of Oxford Street. Public transport in London can get extremely hot and claustrophobic, so I rejoiced at the opportunity to just step out of the hotel and be strolling through Hyde Park within minutes. As a bonus, my airport bus also had a stop very close by. While it looks rather unassuming from the outside, this hotel is actually huge. Maybe I’ve been staying in small, boutique hotels for too long, but I remember walking in and being floored by the size of the place (which has over 700 rooms, plus meeting space and restaurants!) As I previously mentioned, I wasn’t able to enjoy the hotel breakfast, but there’s a restaurant and bar onsite, along with a deli for quicker food options and an executive lounge as well. While taking a peek at the lounge, we also stopped by the hotel gym, which earned a passing grade from my gymrat boyfriend! 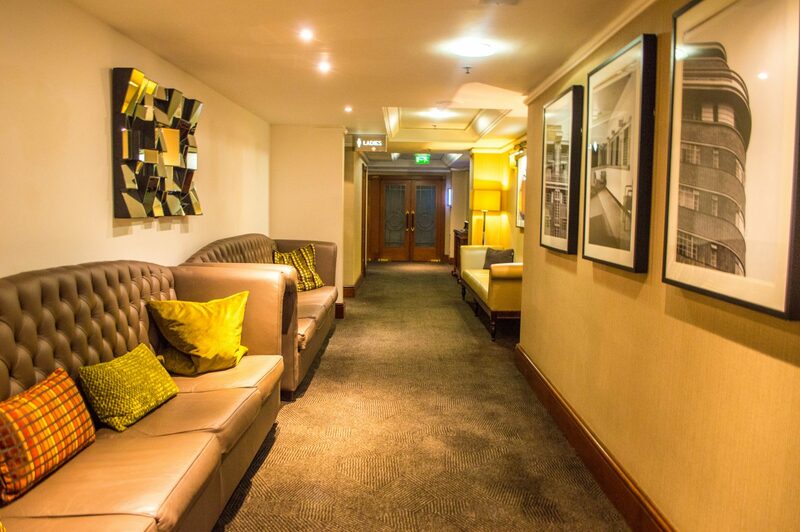 I have nothing but positive things to say about the Amba Hotel Marble Arch! 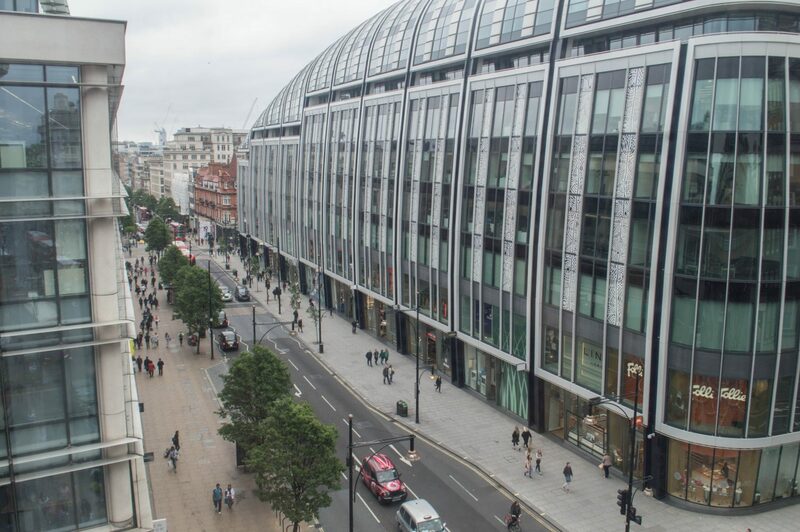 If a central location and warm service are important to you, then this hotel is well worth the price for a comfortable and convenient stay in London. I hope you enjoyed that Amba Hotel Marble Arch review. Please note that I was a guest of the Amba Hotel Marble Arch, but as always, opinions are my own. PS: This post contains affiliate links for which I’m given a modest commission that helps keep this site running! 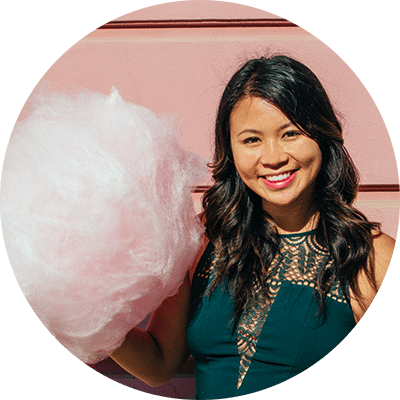 This comes at no extra cost to you, but if you have any questions, feel free to email me at hello[AT]happytowander[DOT]com.